← Lucky Grilled Cheese winners! In honor of Cinco de Mayo this week, I’m mixing it up from the popular taco-enchilada cycle with Huevos Rancheros. You’ll see a variety of ways out there to make huevos rancheros but mine was inspired by a tasty brunch that I had at Milwaukee’s The Eatery on Farwell several months ago. After eating their version I kept craving it and had to recreate it. It won over the hubs and is now on regular rotation both as a quick weeknight dinner and a Sunday breakfast at our house. Since you assemble each plate separately, it makes it easy to adjust egg preferences based on individual needs/tastes and allow each person to top the dish with the condiments of their choice. Usually I prefer poached eggs since the oozing centers mix with the cheese sauce into creamy awesomeness but since I’ve been pregnant I’ve been scrambling my portion instead. The recipe is for two but can be easily increased to serve more. * note: Cheese and liquid measures are approximate. Simply add more in little bits to reach desired consistency. NOTE: You’ll be using multiple burners on your stove at once and as with most egg dishes, this moves fast so getting your ingredients prepped first is key. Place two tostadas (or hard taco shells broken in two) on each plate and set aside. Slice avocado and prepare pico de gallo and set aside. In a saute pan, begin cooking chorizo over medium heat. Continue cooking chorizo while you work on other components, about 7-8 minutes. In a small sauce pan, melt 2 Tbsp butter over medium-low heat. Whisk in flour to create a roux. Gradually whisk in half and half and half of the milk, whisking out any chunks of flour. Stir in cheese and let melt, stirring occasionally for 3-5 minutes. Whisk in additional milk of mixture is too thick to get a smooth, semi-thick and creamy sauce or whisk in more cheese if mixture is runny. Dust lightly with salt and whisk well. Keep on low heat, stirring occasionally, until eggs are cooked. 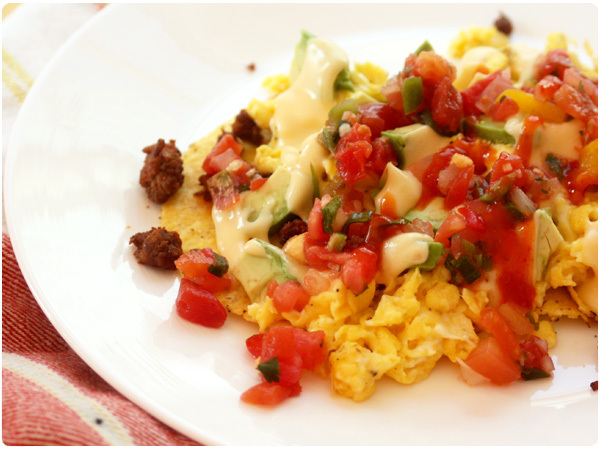 For scrambled eggs: As your chorizo and cheese begins to cook, crack eggs into a small bowl and add a splash of milk. Whisk well. Add 1/2 Tbsp butter to a non-stick pan over medium heat. Once melted and pan is hot, pour in egg mixture. Stir occasionally, scraping pan to fluff and scramble eggs until eggs are cooked and fluffy, about 3-5 minutes. Sprinkle lightly with salt and pepper. For poached eggs: We use this odd Depression-era egg pan of my husband’s but here is an easy picture tutorial to get it right without a special pan. 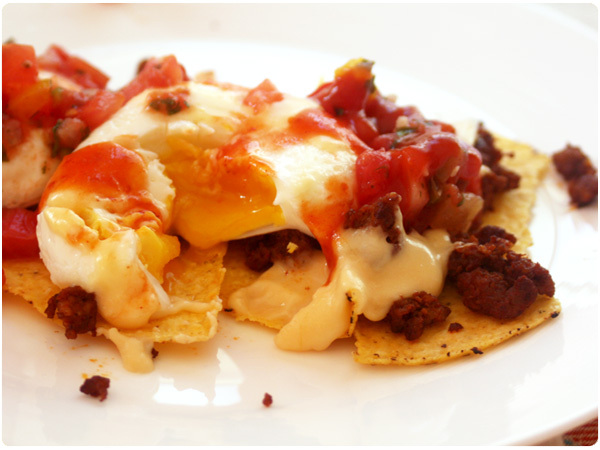 Top tostadas with chorizo and eggs. Layer on avocado and pico. Drizzle with cheese sauce and hot sauce. Serve immediately. I love the idea of using a poached egg…sounds absolutely delish! I’m having a Cinco de Mayo party!! I’m brainstorming some ideas now. Love it, love it love it!! This is some serious Mexican… I can imagine this going down real smooth with my margaritas (it is noon somewhere in the world!!) or even a bloody mary…. f.a.b.u.l.o.u.s! This looks awesome! My adopted Latino son’s bday is on cinco de mayo, so I may just have to try this recipe out for him. How gorgeous do these pictures look? Pretty much so. Definitely giving these a try. Your Cinco De Mayo recipes sound and look utterly delish. Wonder if there are vegan versions. At any rate Happy Cinco De Mayo to you, your family friends both off and online. That looks absolutely delicious. Going home and making THAT. Great ! When I lived in Mexico i usually eat Huevos Rancheros with sliced fresh green jalapenos. Omg, this look so good! I want to make it right this minute! Congratulations for being featured on Freshly Pressed! I’m a first-time visitor and enjoyed your post – looks delicious. Love your blog too. Look forward to reading more. i saw the picture of the huevos rancheros, and i think i’ll need to hit up the grocery store after work to cook up some eggs. thanks for the inspiration! Love huevos rancheros. What a great way to start the day! Congrats on being Freshly Pressed. These pictures make me hungry! They are so very much better than I can scrape together. The poached egg sounds like it would be perfect on this dish! Yum! Thank you for sharing this recipe. I have always been afraid to make cheese sauce, but this looks very simple and straight forward. Can’t wait to try! it must be delicious!! thanks for sharing us the recipe. le comida es deliciosa! feliz cinco de mayo! 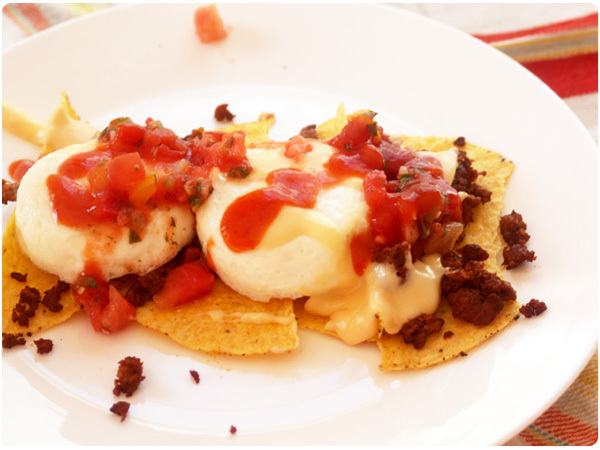 Hi, I’m from México and I had never heard about huevos rancheros in this version with cheese sauce, and I have to say I loved this idea. 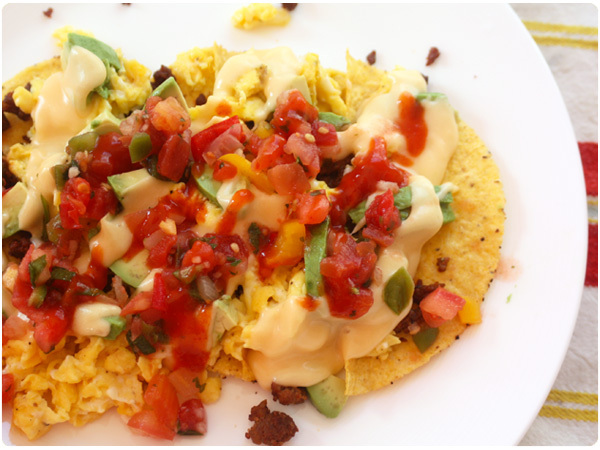 In México, we commonly use the tostadas as a spoon and not as a layer; also, huevos rancheros usually are not scrambled. But I repeat, your idea is very interesting to me, so I’ll ask my mom for some help to cook this version of eggs. @Danagu – Thanks for sharing more of the “real” way to do it! The cheese sauce is definitely a twist on the recipe and a tasty one. And I hear ya on the scrambled…unfortunately being pregnant limits my options with needing fully cooked eggs. Gee, thanks, you’ve made me hungry. 😛 Will try this out sometime! Feeling hungry… will try this. These look fabulous! Check out my blog for some lower calorie Cinco de Mayo swaps & tips for healthier Mexican foods too. Love me some Mexican…can’t get enough–so thank you! oh my goodness, looks delicious! im going to have to take this recipe from you =] thanks! My taste buds are doing sommersaults! YEAH MON! Thanks for sharing content to read. I’m happy to read it.